Editor's Note: This commentary first appeared on the National Institute for Latino Policy website. Argo is a 2012 feature film Hollywood thriller loosely based on a memoir written by Antonio "Tony" Mendez, a CIA operative, who led the rescue of six U.S. diplomats from Tehran, Iran during the 1979 Iran hostage crisis. The film stars Affleck as Mendez, was co-produced by Affleck, George Clooney, and Grant Heslov, and was directed by Ben Affleck. The film is well done and satisfying as a thriller, and is now being touted for awards consideration for the Golden Globes and Oscars. Although there are many issues with the historical accuracy of the plot as well as the portrayal of Canadians, and the Iranian people; and I understand these issues as I have made a career of producing historical films and biographies where I have striven to be as accurate as possible. I get that dramatizations and inventions are part of the necessary compromises needed to create a historical dramatic entertaining film. However, what has been done in Argo falls into a different category of perpetuating ethnic and racial invisibility of Latinos in Hollywood. 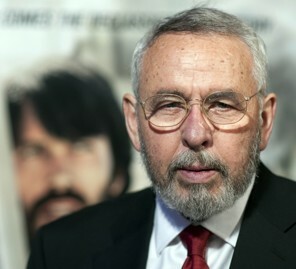 Antonio "Tony" Mendez is an American hero of Mexican ancestry whose exploits are dramatized in the movie Argo. He was awarded the Intelligence Star for Valor for his role in the rescue. He retired with the rank of SIS-2, the equal to a two star General in the military. He was also awarded the CIA's Intelligence Medal of Merit as well as the Intelligence Star and two Certificates of Distinction. Antonio Mendez was one of fifty officers awarded the Trailblazer Medallion from among all officer in the history of the CIA. 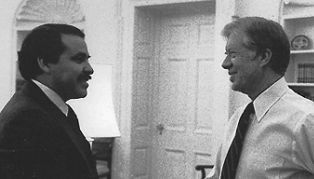 I have a tangential connection to the events portrayed in the movie as I was working for Jerold Rafshoon, President Carters' Communications Director in the White House during this time on the reelection media campaign. I witnessed the impact of the Iranian hostage crisis on the reelection efforts. The concern I am focusing on here is the director/producer's choice to portray Tony as if he is a white non Latino, so he could play the role. This is classic "brown face" at its worst. There is no reasonable justification for this choice as the film could have been cast otherwise without affecting its commercial viability. Not only did a Latino actor not play Tony, who clearly in real life looks like a Chicano, but his ethnicity is stolen from the Latino community at a time when Latinos have been demonized. Our real Latino national heroes if acknowledged would dramatize our patriotism and contribution to the United States. The film actually goes out of its way to obscure Tony Mendez' ethnicity. His name (Mendez) is mentioned only once and the character says he is from New York (Tony was born in Nevada from a mining family with six generations in Nevada and raised in Colorado). Nowhere in the movie does the viewer get that the hero is Mexican American. Ben Affleck's portrayal of Antonio "Tony" Mendez was very contained and had very little range, I don't know what Tony personality is like to judge the portrayal but this did not impact the movie's success or failure. It was an excellent role that would have elevated a Latino actor like Benjamin Bratt or Michael Peña. Instead, like with the story of Guy Gabaldon, whose extraordinary achievements in the WWII Battle of Saipan, capturing, by himself, 1800 enemy soldiers, more than any other American soldier in the history of our country, was similarly white-washed as Jeffrey Hunter played him in the 1960 film, "Hell to Eternity." But that was more than half a century ago, Argo is now. In the closing credits, the photos of the real people portrayed are presented side-b- side with the actors' photos showing the very close resemblance and care that was taken in the casting process to cast actors who looked like the real people. Yet, for the key role of Tony Mendez, the director/producer Ben Affleck chose a single long shot of Tony with President Carter where his image was not distinct or recognizable, breaking the pattern he had chosen for all the other real people depicted. In Argo we have yet another instance where the public has been denied of an opportunity for all Americans to learn of an American Latino's valor, talent and patriotism. This occurs because there has been no consequence to this behavior. It is time for a change. Moctesuma Esparza is an award-winning producer, entertainment executive, entrepreneur and community activist. He is CEO of Maya Cinemas, a first run mainstream theater chain in the United States principally located in and serving Latino communities , and a partner of Robert Katz in the company Esparza/Katz Productions. He has produced over thirty films, and has won over 200 awards. He is the producer of such films as the Ballad of Gregorio Cortez (1981), Selena (1997), The Milagro Beanfield War (1988), Gettysburg (1993), Teddy Roosevelt and the Rough Riders (1997), Introducing Dorothy Dandridge (1999), Gods and Generals (2003) and Walkout (2006). A participant in the 1960s-era movement for the civil rights and equality of Mexican-Americans, Esparza remains committed to public service, donating his time to educational, cultural, and professional organizations, especially those that aim to educate Latinos in business and media. He was born in Los Angeles, California and received a B.A. of Theatre Arts-Motion Pictures, Television in 1971 and a M.F.A. of Theatre Arts-Motion Pictures, TV in 1973 from the University California Los Angeles. He can be reached at moctesumae@mayacinemas.com. Thank you for writing this! It had to be written. Gracias mil. "Not only did a Latino actor not play Tony, who clearly in real life looks like a Chicano..." What does a real life Chicano look like, a "brown face"? I suppose, then, the proper Chicano looking actor should have had many of the other stereotypical features the general public imagines when they hear/see the word Chicano. In my opinion, this statement contradicts your argument and what you are trying to fight against. Americans won't "learn of an American Latino's valor, talent and patriotism" simply because he is played and depicted by a "Latino-looking" actor, who, in this case, should have looked "Chicano". I wasn't crazy about Affleck playing the part either, but comments like these send a mixed message and dilute the movement. I saw Argo opening night and I thought it was a pretty decent movie. I was totally absorbed in the story and history of it all. It had me on the edge of my seat a few times and I had to grip my husband and turn to him a few times with "Wow, that really happened in real life?". It was so cool watching a historical film about a subject I knew almost nothing about having been born after this happened in history. I was enthralled. Totally lost in the magic of movies and storytelling, I was having such a great movie night, popcorn on my lap, chocolate covered raisins, Fiji water, my hubby next to me. Perfect movie night. Suddenly I heard the name Mendez referring to Ben Affleck's character in the movie, I started to shift uncomfortably in my seat. Was Ben Affleck playing a Mexican? I shook it off. No it couldn't be. I giggled at my silly thought. I turned to my husband and just to make sure I asked, "Is his name Mendez?". My husband nodded yes. Hmmm? That's curious. Then I hear him referred to as Antonio Mendez. Curiouser and Curiouser. And then ultimately I see the photo in the end of the real life Antonio Mendez who appears to ethnically resemble the classic look of what appears to be a man of Hispanic, Chicano, Latino, Mexican, American of Mexican descent, whatever you want a call it, but not a white dude. As the credits rolled and we left the theater I felt a sick feeling in m stomach. Oh god, I like this movie but did Ben Affleck just portray a Mexican American hero and never elude to the fact that he is Mexican and the movie going audience will never know that this American hero is Latino? Please say it isn't so. When we got home, I googled Antonio Mendez right away. The sick feeling in my stomach was replaced with a confirming punch in the gut of a sad reality. Latinos still can't play Latinos in major Hollywood motion pictures. Not if they can get away with it. So totally lame. Really? Is this still happening? Would it be OK for Ben Affleck to play Martin Luther King but as a white Martin Luther King, you know cause it's not important that Martin was black, right Hollywood? Or is it OK that Ben Affleck play Geronimo and just kinda leave out the fact that he is Native American? No it is not OK. Then why is it OK to do this to Latinos? If it were any other race that was white washed and denied it's true history, people would be marching outside theaters showing Argo with signs denouncing the producers and it's "Star". To deny our heritage as heroes and in this time of such great inequality and prejudice against people of Latino descent is just plain sad. I know, I can hear the rebuttal now, "...but actors should be able to play whatever roles they want, what about Ben Kingsley in Gandhi? Sure that would have been nice to give an actor from India the opportunity to play Gandhi, it would have been great, I'm sure, but when I think of that movie I always think of how awesome Gandhi was and how he was from INDIA! Are you getting the point here? So as I shuffled back to our car after the movie, I turned to my husband and said "Isn't that lame that Ben Affleck would take away this role from a Latino actor? I can't believe he took that opportunity away and no one is ever even going to know that the hero of this movie was Mexican." My white and wonderful, filmmaker, intelligent, college educated, loving husband, married to a Latina turns to me with total sincerity and says "He was supposed to be Mexican?" I rest my case America.